The chase began as an attempted traffic stop and went through five state counties, according to WFAA-TV. Reportedly reaching speeds of 100 mph, the driver, identified as Jonathan Davis, kept on trucking at 50 mph after popping two of his tires on spike strips. When police shot out at least one other and Davis crashed his car into a median, KCEN TV reports that he finally stopped. As for why he fled from the cops, Davis said that he’s tired of getting arrested for marijuana—something he “always” has on him. Davis said the drug charges on his record prevent him from being able to get a job, but did admit that this recent police chase was a thrill. All 90 minutes of it. But the chase wasn’t all about high-speed thrills, as Davis said he posted to both his Snapchat and Instagram accounts while driving. 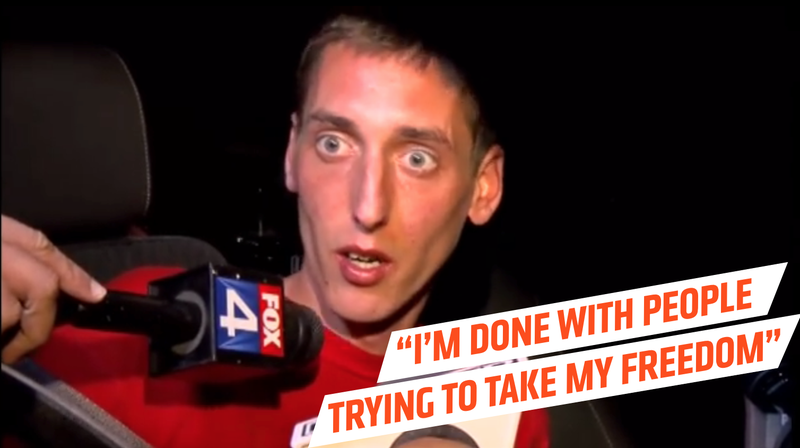 Following a check of his account, Fox 4 did not find any Instagram posts related to the chase. According to Fox 4, Davis now faces charges for evading arrest, possession of a controlled substance, marijuana possession and driving while intoxicated. Since Davis told us all the extent of his police hatred in his minute of media fame, we can make an educated guess on how he feels about that.